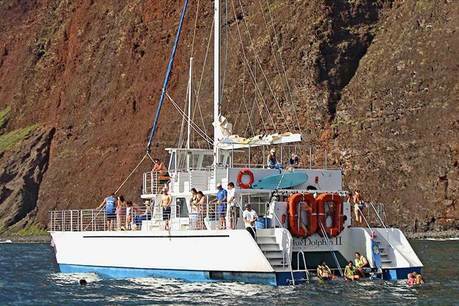 Are you ready for 5+ hours of Na Pali Coast sailing, snorkeling or scuba, food, drinks, dolphins and more? You'll see spectacular sea cliffs, enchanting waterfalls, timeless lava tubes and even whale watching when in season. This tour guarantees dolphin sightings on all of their morning excursions! This crew does an excellent job of telling you all about the history and legends of the ancient civilizations that once inhabited these verdant valleys. 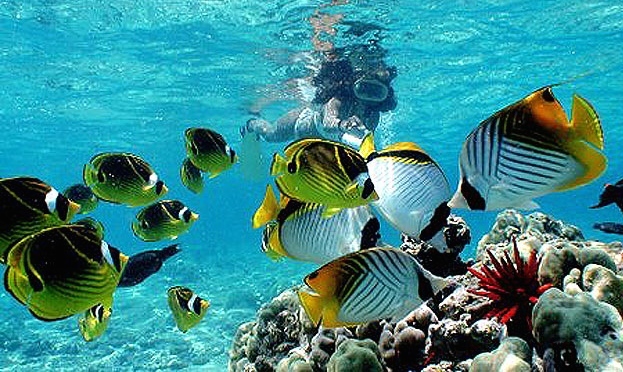 For snorkeling you'll anchor at a tropical reef to explore an underwater ecosystem and look for green sea turtles. Enjoy a delicious continental breakfast with coffee, tea and juices on the way to your snorkel and scuba destination. Once there, it's time for fun in the water! Snorkel or scuba, float on boogie boards or noodles, and take a turn on the water slide. On the way back you can enjoy a delicious deli lunch buffet and the magnificent coastal views with a glass of wine, beer, soda or Mai Tai. Includes: Snorkeling gear, breakfast, lunch, and beverages. Passengers enjoy large shaded cabin areas, clean restrooms and freshwater showers aboard this 65 foot deluxe catamaran that was specially designed to navigate the waters of Kauai for a smoother ride. For those who choose to scuba, instruction and gear is included in your price. Underwater cameras and wetsuits are available for rental. Wear/Bring: Swimsuits, towels, sunscreen and jackets. I recommend layered clothing for comfort in any weather conditions. You can always change on board. These top-notch captains and crews are focused on providing the most enjoyable experience for my guests. Tour destinations and snorkeling stops will be determined based on weather and sea conditions for optimum passenger comfort and safety. Scuba diving includes all equipment and instruction – no experience needed. No pregnancies. No children under 2 years. No back or neck injuries or recent surgeries. Guest must be able to manage stairs.